JUTE CLUTCH WITH WOODEN HANDLE . DESIGNER JUTE CLUTCH. We manufacture and export an enticing collection of Embroidered Hand Bags known for rich designs and intricate embroideries. 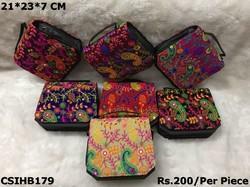 These bags are manufactured using premium quality fabric and as per the latest market trends. We offer these bags in various shapes, sizes and numerous color combinations that go along with any occasion and attire. 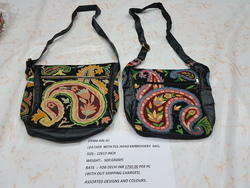 Embroided hand bags for womens.beautiful designer hand bags .useful in Daily use. This bag is made with hand embroidered fabric. Elegant & robust stylish Embroidered Ladies bag made from genuine Suede. Available in assorted designs & colours. Suede Tote Bag is also provided by us. We offer a comprehensive range of Embroidered Hand Bags. With our huge experience in the industry, we understand the demands of clients therefore we bring forth most useful and beautiful looking items for them. It is available in different colors, unique styles and in various patterns. It is designed specifically that reflect elegance with high ethnic taste.